When it comes to AMD Radeon HD 7970 video cards, one of the most sought after cards is the ASUS MATRIX HD 7970 Platinum graphics card that is available under the part number MATRIX-HD7970-P-3GD5 for $499.99 shipped. This card has the AMD Radeon HD 7970 ‘Tahiti’ GPU core clocked at 1100 MHz and the 3GB of Hynix GDDR5 RAM is clocked at 1650 MHz (6600 MHz effective). The stock core clock on the AMD Radeon HD 7970 is 925 MHz, so this card features a 175MHz core clock increase. This is a 18.9% improvement, so it already has a fairly hefty overclock on it from the factory. Don’t think for one second that is all that ASUS has changed on this card. ASUS basically took the factory reference design and threw it out the window. The companies engineers in Taiwan burnt the midnight oil and came up with an entirely custom card. Pretty much the only thing on this video card that is similar to the original design is the GPU itself. Is that radical enough for you? You can run out and get the lowest cost AMD Radeon HD 7970 for around $387 shipped after rebates, so hopefully all these customizations will make up for the ~$110 price premium that this card carries. 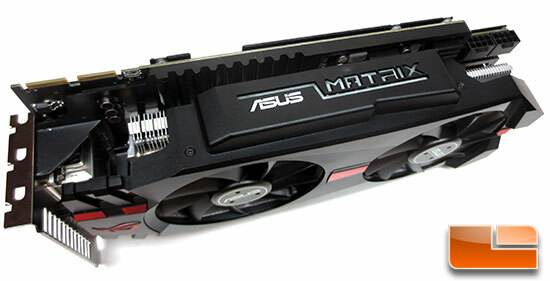 Let’s cut the chit-chat and start looking at the ASUS Matrix HD 7970 Platinum 3GB video card! 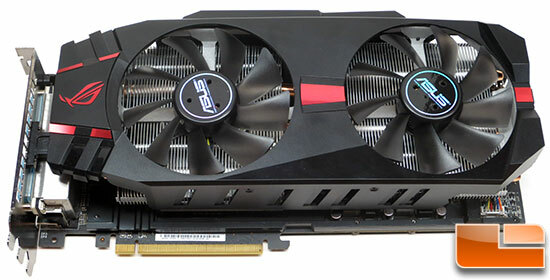 As you can see from the image above, the ASUS Matrix HD 7970 is a very nice looking video card that is primarily black with some red accent touches. 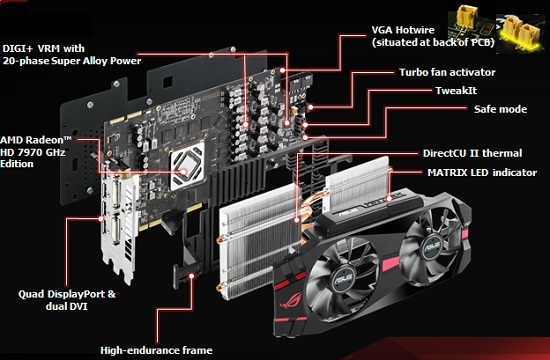 The red and black color scheme is pretty much standard on ASUS Republic of Gamers (ROG) products, so this video card will complement an ROG motherboard for example. Once you take in the colors, you’ll see that ASUS is using the DirectCU II dual-fan GPU cooling technology to help keep the card nice and cool. Notice that this card takes up three expansion slots, so it is a very big card. How big? Well, our measurements put the Matrix HD 7970 at 11.1875″ in length and 5″ in height! The card feels great as well with a solid build construction thanks to a metal back plate and metal fan shroud. The Matrix HD 7970 weighed in a 3lbs 2oz, so why ASUS used metal backplates and brackets to keep the PCB nice and straight. As we mentioned earlier ASUS is using their DirectCU II technology on this card. 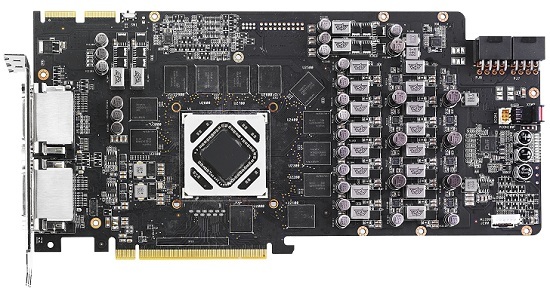 This means that it has five 8mm copper heat pipes that are directly touching the GPU and then three of them go to one aluminum cooling fin array and two to a block directly over the GPU. Each of the independent cooling fin sections has a 100mm fan blowing directly over them. ASUS says these two fans deliver 6x more airflow and are 3x quieter than the AMD reference design, resulting in a 20% lower operating temperatures despite the overclock. These fans are also ‘dust proof’ in design, so they will stay cleaner inside the motor housing and last longer than standard fans. ASUS also offers independent control of the fans. the card. The card does have plenty of holes across it, which help for air circulation and reduce weight. 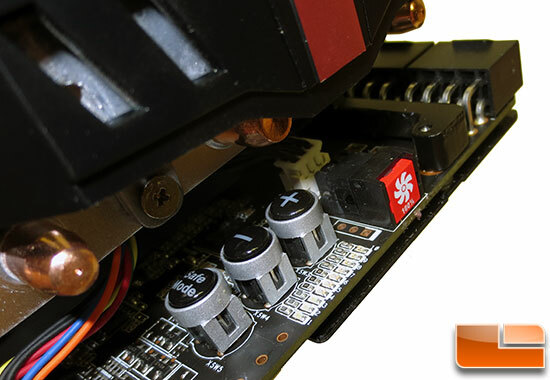 Notice that ASUS moved the SAP CAP capacitors away from the GPU. These are usually directly behind the GPU, but were moved to accommodate extreme overclockers GPU pots. Directly above the GPU you might have noticed that there is a large black component clearly visible through the backplate. 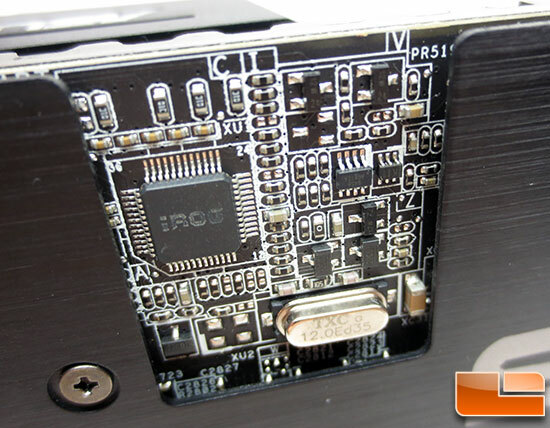 This is the iROG controller and it handles all the PLL and vMEM voltages on the card. It also controls the VGA hotwire features. ASUS uses a 20-phase Super Alloy Power technology on this card and told use they used industrial components on it to ensure a long operating life. Along the right edge of the card you’ll see one of the many features that make this card stand out from the crowd. 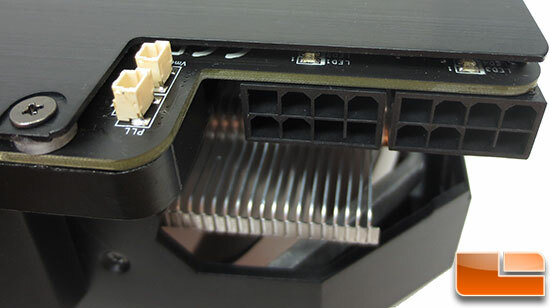 This is called the VGA Hotwire corner and is where ASUS has placed the connector for monitoring the Vcore and various solder points additional tweaks that overclockers often use. VGA hotwire allows for additional voltage to be supplied to the card for the GPU Core, Memory and PLL. In addition it also provides monitoring. This is independent of the standard Probe points for referencing of voltages on the card. 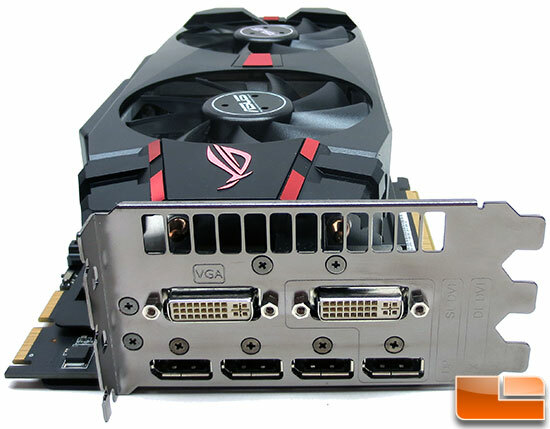 As you can tell, ASUS designed the Matrix HD 7970 with heavy focus on overclockers and power users. meaning power connections are not. To the left of the power connectors you’ll see the PLL and Vmem hotwire connectors. 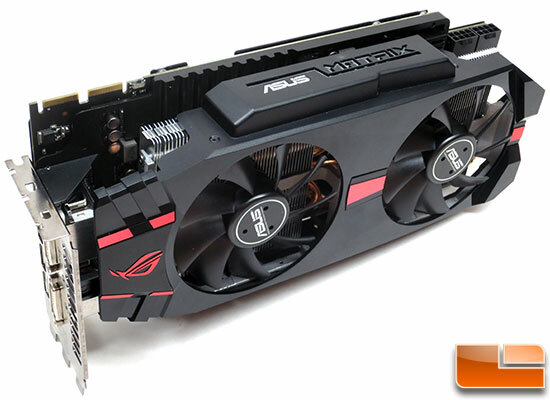 As you can see ASUS has made it pretty easy to volt-mod the Matrix HD 7970! 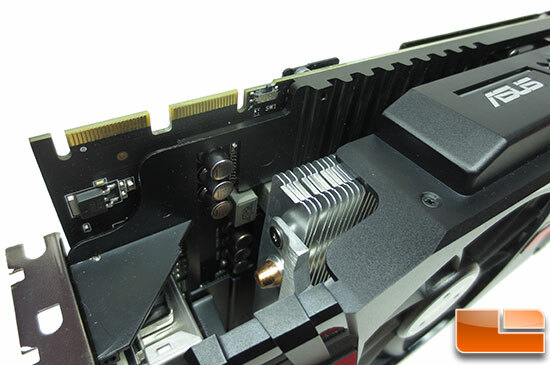 The ASUS MATRIX HD 7970 can be run in Crossfire and has a pair of Crossfire bridges located along the top edge of the card. You should be able to run four of these together in 4-way CrossFireX in theory, but with each one taking up 3 PCI expansion slots there isn’t a desktop case or motherboard that would support that. Take note that ASUS also has a BIOS switch, but it it not a BIOS switch. It changes the vBIOS display output functionality allowing for a 6-way Eyefinity setup (2 single links) or a 5-way (single link and dual link). Differences in display resolution will occur to the DVI ports under this configuration. overclocking as you can be running a benchmark and if you start to see artifacts or issues you can just click these buttons for more or less power. overclocking, so you can focus on having fun. Above those three buttons you have the 100% fan speed turbo button. This button puts the fans at 100% power with just a click of a button. There are also 10 LED lights to show you how far you’ve increased the voltage. 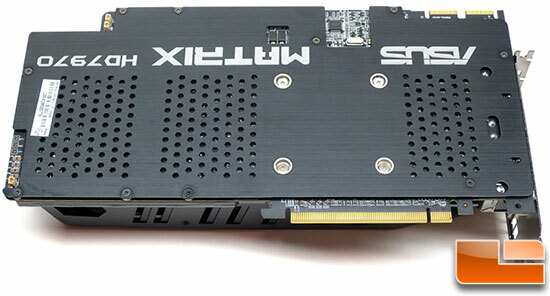 Since the ASUS MATRIX HD 7970 takes up three expansion slots, ASUS was able to run pretty much any video connection types that they wanted due to all the space. At the end of the day you can see that ASUS went with a pair of DVI-D outputs that are rated to support resolutions up to 2560×1600 (2048×1536 w/ D-Sub). You also have four full size Display Port connectors! It’s nice to have regular sized outputs as you don’t need any adapters. If you want to run a three panel setup with DVI cables then you will need an adapter and you’ll also need adapters if you want to run HDMI. 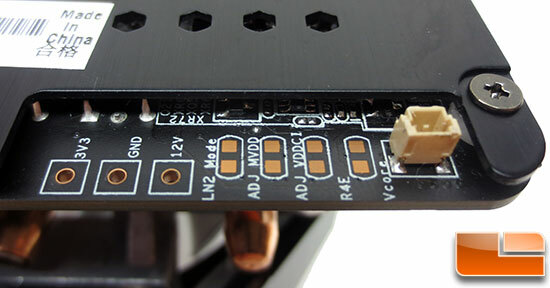 Lastly, we have the ‘MATRIX LED load Indicator’ located along the top edge of the video card. ASUS uses five multicolored LED indicators behind the word ‘MATRIX’ at the top of the card to give you a visual display of the current GPU load on the card. Most gamers will see it blue (at idle) and red (under load). If you look under the fan shroud and above the PCB you’ll see the “high endurance frame” (the metal black part above the PCB) that ASUS uses to keep the card straight and it actually acts as a heatsink for some of the boards power management. This card uses ASUS DIGI+ VRM with 20 phase Super Alloy Power, so it is very beefy. We were going to take apart the card to show you the PCB components, but you have to remove the red decals that are glued down in order to take off the fan shroud. We didn’t want to glue the card back together, so we didn’t do this. We could have removed the entire GPU cooler from the backside, but that would mean that we have to clean off the thermal compound and we wanted to leave that alone for temperature testing reasons down the road. Here is a shot provided by ASUS of the bare PCB. You can clearly see the twelve Hynix GDDR5 memory chips that make up the cards 3GB of memory and the 20 power phases. As you can see ASUS has customized this card from top to bottom! If you have any more questions on the Matrix HD 7970 video card we found a great video done by JJ over at ASUS. He took an in-depth look at the Matrix HD 7970 graphics card in a 30 minute long video that covers everything in great detail. You can also download the reviewers guide that ASUS gave us here. In this guide you’ll find some additional details on on the cards layout if you still have feature questions. Now that you have read nearly 2,000 words about the ASUS HD 7970 Matrix Platinum 3GB video card and its features we can check out the bundle and get to testing!